Loon's SidlaKasilak Festival is the only evening street dancing event in Bohol. Friday evening’s Street Dancing and Dance of Lights Competition in Loon put the light in delight as flickering lights danced in rhythm divine – a tribute to the town’s Nuestra Señora de Luz, whose feast day is celebrated today, the nativity of the Blessed Virgin Mary. The highlight of SidlaKasilak, Loon’s 10-day Festival of Lights in Honor of Our Lady of Light, the Street Dancing and Dance of Lights Competition is a nod to the past religious processions in Loon where the faithful would light candles in colorful hand-held lanterns or parow (parol). The Dance of Lights, whose contest criteria revolve solely on the lights (lantern design, lights movement and synchronization, etc. ), is the only evening street dancing event in Bohol. This year's SidlaKasilak is strictly candles-only. Where in the past years, it was dominated by the more dynamic, hi-tech LED-lit lanterns, the September 6 Dance of Lights showdown went back to the festival roots with the reinstatement of the candles-only rule. The effect, more solemn, dramatic. There were to categories, the Barangay and the Secondary School categories, in the two events: Street Dancing, a short progressive rhythmic parade of lights in the main street fronting the Loon Public Market, and the Dance of Lights showdown on the grounds fronting Loon’s majestic Birhen sa Kasilak Parish Church. In the Dance of Lights Competition – Barangay Category, participated in by the three poblacion barangays of Loon, Napo, Moto Sur and Moto Norte, a more “traditional festival” live percussion music accompanied the performances. Vangelis' Conquest of Paradise added to the rousing mood of the Dance of Lights. A combination of mood and majesty filled the Secondary School category, where the flickering parow’s moved to the tune of Vangelis’ Conquest of Paradise. The soundtrack from Ridley Scott's 1992 film 1492: Conquest of Paradise, the song’s fluxing epic melody is accented by rousing dramatic vocals of Pseudo-Latin lines – In nòreni per ìpe/ in noreni coràh/ tiràmine per ìto/ ne dominà – repeated several times throughout the piece. Imagine that with the beautifully and creatively choreographed movements of handheld lanterns – sometimes appearing as floating lights, parading in an undulating cadence, or gigantic phosphorescent flowers, blooming, whirling, dancing – backdropped by the Loon Church façade, it was mesmerizing, almost hypnotic, illuminating. Once again, with the SidlaKasilak Dance of Lights Festival, the Loonanons shines through. But glowing most on September 26, 2013 were the winners of the SidlaKasilak 2013: Street Dancing and Dance of Lights Competition. In the Barangay Category, Barangay Napo won first place, while the Barangays Moto Norte and Moto Sur won 2nd and 3rd places, respectively. The Most Artistic Lanterns and Best in Street Dancing Award in the Barangay Category went to Moto Norte. The winning team of Sandingan National High School with the judges and organizers. Sandingan National High School bested six other teams in the Secondary School Category, taking home the top prize plus the special award of Best in Street Dancing. Saint Teresa Academy was judged 2nd best, while the University of Bohol (UB) Loon Institute trailed close in third place. 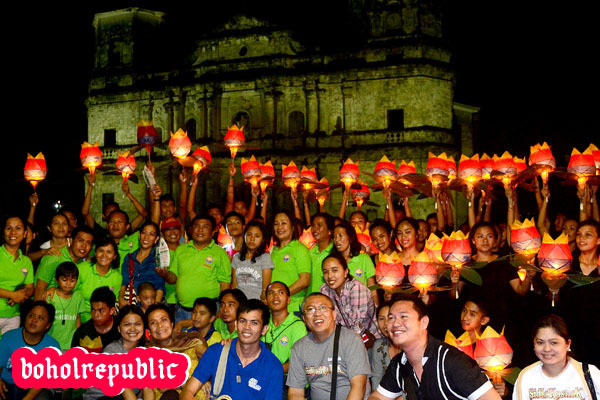 The Secondary School Category Special Awards for Most Artistic Lanterns went to the Cabilao National High School. A Hall of Fame Award was conferred to the Jacinto Borja National High School, who has consecutively emerged as champions in the last three years 2010, 2011, and 2012. This story also appears in today's LifestyleBohol issue, The Bohol Chronicle. Dramarama: Boholano Drama is Alive!